Are you ready for Thanksgiving? I can't believe it's just a few days away. This year Hubby and I are going to my Grandparents house for the big feast, as we do most years. And like last year, we are going up a day and half early to help Grandma prepare the big meal. I'm super excited as there are few things I'd rather do than spend the entire day cooking and baking with my Grandma. I'm already getting hungry thinking about some of my favorite dishes. 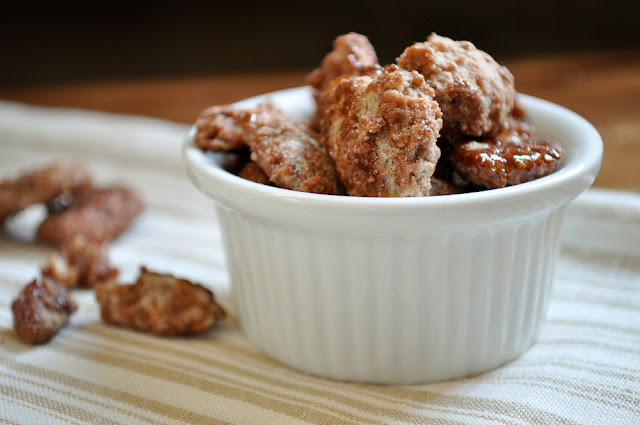 While I have to wait a few more days for Turkey Day, I'm enjoying the flavors of the holiday now with these salted candied pecans. I found this recipe on Desiree's blog, Steak N Potatoes Kinda Gurl--my blog assignment for this month's installment of Secret Recipe Club. I always look forward to Secret Recipe Club so I can get to know a new blog. I enjoyed scouring Desiree's blog and of course found several things that sounded really good. Including a cranberry gorgonzola salad and lemon sour cream pie. Then I came across the pecans and thought they would be delicious in a variation on Desiree's cranberry gorgonzola salad (more on this below). And for the record, they were delicious in that salad. But you'll have to wait a few days for the post. Today it's all about the pecans. I have made one other candied pecan recipe which calls for baking the pecans...resulting in a stick in your teeth kind of candied nut. This recipe prepares the pecans on the stove top and the outcome is really more like a piece of candy vs a nut. It's really crunchy with sweet warm flavors. The lightly crystallized sugar coating (without being sticky) makes these so amazingly delicious. I couldn't keep my hands off them...they just kept popping in my mouth. Hubby likes them too. Good thing I doubled the recipe. I definitely prefer the stovetop method and will be adding this recipe to the keeper list. There's a hint of cinnamon, which gives them a little extra something special. They pair beautifully with that variation on Desiree's salad I mentioned. I'm calling it a harvest salad--romaine lettuce, honey crisp apple slices, dried cranberries, sliced green onions, feta crumbles and crunchy salted candied pecans finished with a balsamic vinaigrette. Or these sweet beauties could easily top a number of fall inspired desserts or sit out in a bowl for your Thanksgiving day guests to munch on. But be warned, they are addictive so I'm pretty sure the bowl wouldn't be full for long. Add pecans, sugar and water to a medium to large heavy bottomed bottom pan over medium heat. When sugar dissolves, begin stirring. Continue cooking, stirring often, until sugar becomes crystallized (looks like raw brown sugar). Turn heat to medium low and allow the crystallized sugar to melt and lightly brown on the bottom of the pan. Use a heat proof rubber spatula to spoon the liquid over the pecans to coat them. Once pecans are coated (quite a bit of crystallized sugar will remain), sprinkle on salt and cinnamon and stir a few times to evenly distribute. 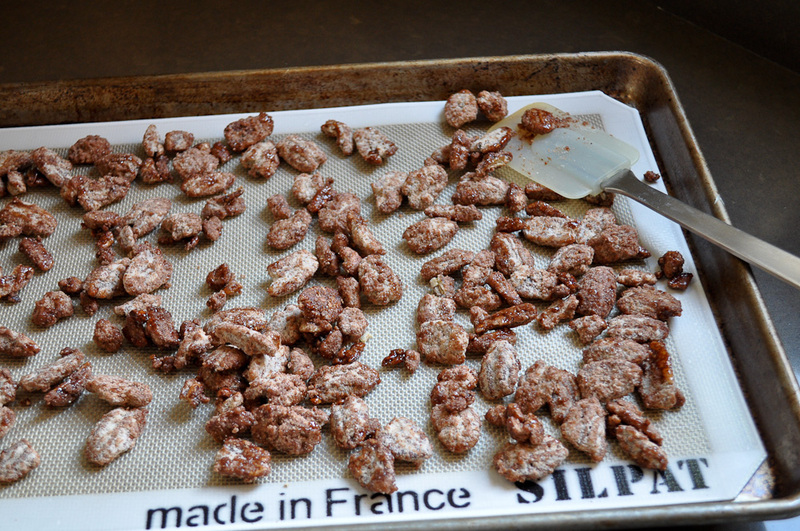 Transfer nuts in a single layer to a silpat (or parchment paper) lined baking sheet and allow to completely cool. your Chai Banana Bread was wonderful!! My family loved it! So great to get to know you and your recipes - you're doing a great job!! I look forward to trying many others. Thank you! Mmmmm. These look tasty and perfect for the holidays...or anytime! Pinning this one! These just scream "HOLIDAY TIME"!!! Lurve! Oh these do sound good! I like the sweet and the salty combo. As Melissa said, great gifts too! Oh, I think I would have doubled the recipe too! These sound amazing!!! These look fabulous. I love nuts, and I love sweet snacks, so this is pretty much the perfect thing to munch on from my perspective! 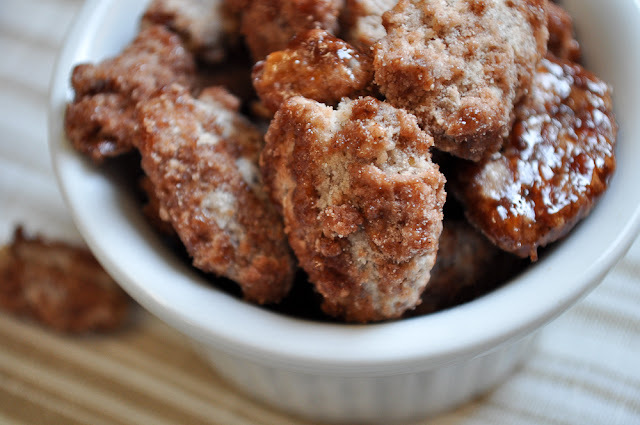 I'd love to make some of these for my family to have around the house for the holidays! Oh man! I wish I had these to eat right now! I love the nuts!!! Such a great snack!! Mmmm! Will definitely try these! I'm so glad I have a pecan tree in my backyard! These look and sounds simply divine!!! I would have a hard time stopping. Great SRC choice!!! I do love pecans--I will make these.